Early this morning NASA’s InSight probe arrived at its new home on Mars, the first successful landing on the planet since the Curiosity rover in 2012. And like anyone who’s just moved to a new place, it’s already posting badly shot photos of dusty, empty spaces online. The Interior Exploration using Seismic Investigations, Geodesy and Heat Transport probe, so named because someone really wanted its initials to spell InSight, was launched from Vandenberg Air Force Base in California this May. 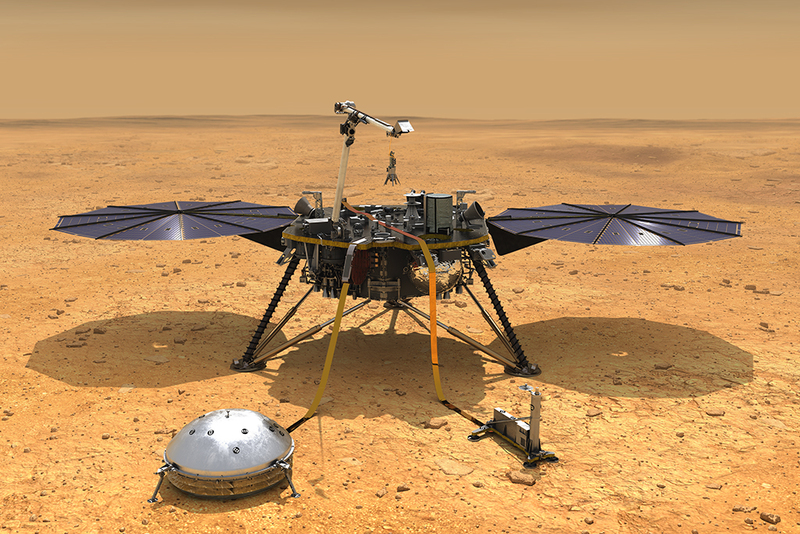 Travelling nearly 458 million km over seven months, the lander arrived at the red planet just before 7:00 am AEDT today and promptly declared its arrival via the medium through which all important announcements are now made: Twitter. InSight landed at Elysium Planitia, a plain about 600km from Curiosity’s landing site. This site was chosen because it is expected to remain relatively undisturbed for the duration of the two-year mission, with steady access to sunlight for its solar panels. Unlike the famous Curiosity rover, which landed on Mars in 2012, InSight won’t be driving around to take in the view. Instead, the probe has been designed to remain stationary upon landing, monitoring signals from below Mars’ surface to learn more about how it and other rocky planets formed. To this end, InSight is equipped with an extremely sensitive seismometer — the first ever seismometer to land on Mars. This will detect marsquakes, meteor strikes, and any other seismic activity that occurs on the planet. InSight also has a spike attached to a tether embedded with heat sensors, which will be hammered into the Martian surface to a depth of up to 5m, and two antennae which will use radio signals to help study the planet’s rotation. Scientists hope the antennas will help them figure out if Mars is solid or hides a gooey liquid centre when you bite into it. The probe is also equipped with two cameras, as evidenced by the partially obscured photo it tweeted shortly after landing. Further images are expected to arrive as InSight gets settled into its new home. Engineers hope to deploy the probe’s 1.8m-long metal arm to take some more photos over the next few days, turning the expensive scientific instrument into the greatest selfie stick known to man.